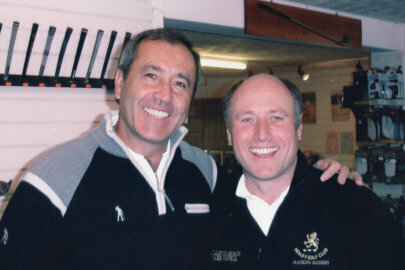 In 1989 Mark established Mark Howell Golf Schools and a few years later Company Golf. These two ventures were recently brought under the umbrella of Corporate Golf Events Limited. For more than 20 years Mark Howell Golf Schools has been training golfers from young promising juniors to touring Professionals using our comprehensive coaching programmes. We now also run several regular junior clinics and adult golf academies as well as tuition trips abroad for golfers of all abilities. In addition, we organise golf coaching and competitions at many schools in the Berks, Bucks and Oxon area and run golf camps for children from Age 6 to 15 yrs during the school holidays. Mark played on the European Tour for four years during the 1980’s. He enjoyed reasonable success whilst on the Tour, including a Hole in One in the Italian Open and he finished in the top ten in many opens. In 1986 Mark held the record for the lowest tournament round in England with a score of 61. He became a club professional in 1985 and has been the Berks, Bucks and Oxon Champion four times. Marks playing background, experience and enthusiasm ensures his place as a top coach. His pupils include young children, beginner adults as well as touring professionals. Some children taught by Mark are now professional golfers themselves. His passion for teaching and his positive attitude enable him to train players of all abilities to get the best out of their game using his unique method as seen in his teaching videos.